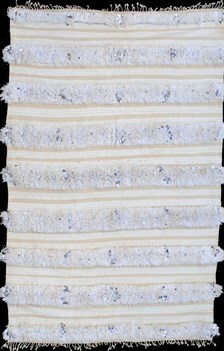 Moroccan wedding blankets, or handira, are created in anticipation of a wedding by the bride’s female relatives. They are woven on looms by hand out of sheep’s wool, cotton and linen. 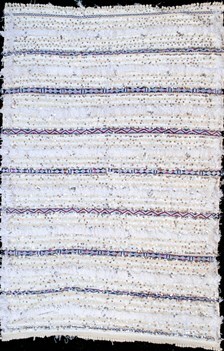 This thoughtful process of hand weaving infuses the blanket with blessings, and when complete, it is not only functional and beautiful, but is a symbol of fertility and good luck. 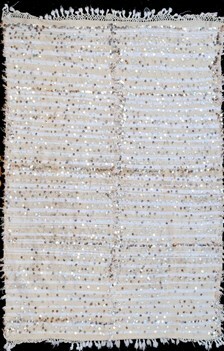 It takes many hours of work to attach the hundreds of mirrored sequins to the blanket once the weaving is complete, during which the bride’s relatives teach her about her marital duties and expectations. Handira are inherently neutral in color, and subtly glamorous owing to the addition of the sequins. 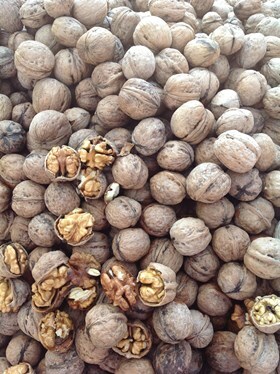 They are just as fabulous in a modern home as they are in their traditional setting!